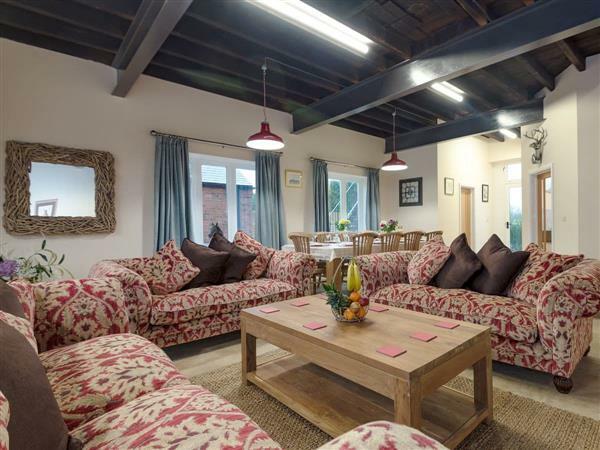 Harbour View in Wainfleet St. Mary, near Skegness, sleeps 10 people. Harbour View near Skegness is close to the river bank; these three, three-storey barn conversions (refs UKC2301 [Haven View], UKC2302 [Church View] and UKC2303) are ideal for families, groups and couples. These wonderful properties make an excellent venue for large families to get together. Each barn has its own enclosed garden with a patio and hot tub, and are in the ideal location for enjoying lovely walks along the riverside and offer good cycle routes straight from the door. Internally each barn has been sympathetically converted and beautifully furnished and decorated, with large feature windows overlooking the river bank. Set close to the River Steeping, at the edge of the owners’ 80-acre arable farm, which guests are free to explore, there is the bonus of free river fishing within the grounds (licence required). On the fringe of Wainfleet All Saints, and within short walk of a famous brewery which offers tours, an on-site pub and a bistro, these properties are perfect for exploring the area. Wainfleet is a quaint market town with and array of shops, pubs, restaurant and a railway station. The traditional seaside resort of Skegness is just 5 miles away, and has a lovely sandy beach and family entertainment, including the Fantasy Island theme park. The National Trust properties of Gunby Hall and Tattershall Castle are within easy driving distance. Visit bird and seal sanctuaries along the coast, or take a trip to medieval Lincoln, with its famous castle and cathedral, just 40 miles away, across the scenic, rolling Lincolnshire Wolds countryside. The beach is 4 miles from Harbour View near Skegness. With the shop, pub and restaurant ¼ mile from Harbour View. These properties can be booked together to sleep up to 30 people. Living/dining room: With 60 Freeview Smart TV, DVD player, iPod dock and tiled floor. Kitchen: With electric range, microwave, fridge, freezer, dishwasher and tiled floor. Bedroom 2: With king-size bed and Freeview TV. Bedroom 3: With 3 single beds and Freeview TV. Bedroom 4: With king-size bed, single bed, Freeview TV and en-suite with shower cubicle and toilet. Please note: There is 1 step down to the hot tub. All properties (refs UKC2303, UKC2301 [Haven View], UKC2302 [Church View]): Oil central heating (underfloor on ground floor and first floor), electricity, bed linen, towels and Wi-Fi included. 2 travel cots, highchair and stairgate available on request. Welcome pack. Enclosed lawned courtyard with patio, garden furniture and barbecue. 80-acre grounds (shared). Hot tub for 6 (private). Tennis court (shared). 2 small dogs welcome. Bike store. Private parking for 5 cars. No smoking. Please note: There is an unfenced river in the grounds, 22 yards away. Holidays at Harbour View run from Friday to Friday. Pets allowed at Harbour View. For a better idea of where Harbour View is, you can see Harbour View on the map below. Harbour View is in Lincolnshire; should you be on the lookout for a special offer, you can find all the special offers in Lincolnshire. It's always worth checking to see what is on offer at the moment. Do you want to holiday near Harbour View (UKC2303), you can see other cottages within 25 miles of Harbour View; have a look to find your perfect holiday location.